KIF Okayama and the US Consulate-General of Osaka-Kobe jointly hosted the lecture “Education for International Understanding.” The event took place in front of 900 high school students, parents and teachers at Okayama Prefecture Okayama Soja Minami High School in Soja City, making this lecture the fifth event Koyamada has done in Okayama Prefecture over the past year. In just one year for Okayama Prefecture alone, the joint lecture program by KIF Okayama and US Consulate-General of Osaka-Kobe has reached out to over 2,600 local students, parents, businessmen, local government personnel, and community supporters to inspire them to study English, study abroad and promote the importance of bilateral friendship ties between the US-Japan. 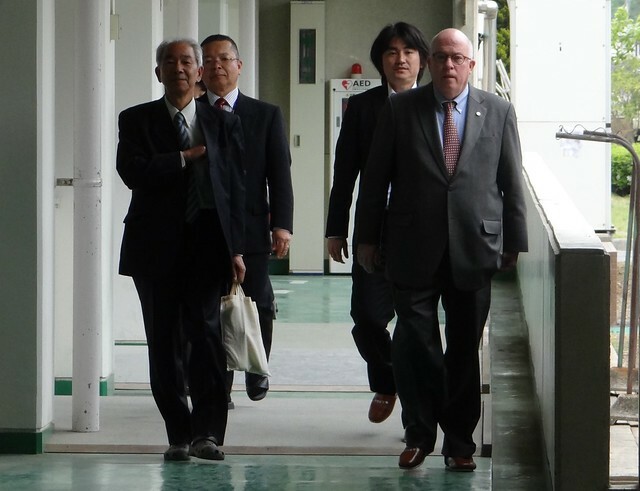 After US Consul General Patrick Linehan met with Mr. Ibaragi, the Governor of the Okayama Prefecture, Linehan had a lunch meeting with Koyamada, KIF Okayama Deputy Executive Director Inoue, and the high school principle in a hotel restaurant that was hosted by KIF Okayama. A productive lunch meeting over, the three traveled to Okayama Soja High School in Soja city. Upon arrival, the school's executive staff and teachers welcomed them at the main entrance where a large American and Japanese flag were proudly flying on flagpoles. After the principle was briefed on the lecture event schedule, Koyamada and Linehan enter the school gymnasium to a rousing applause by over 850 students. After the principle's opening remarks in English, he introduced the audience to the school's national and internationally renowned hip-hop dancing team who gave an energetic performance for the school and speakers. Following the dance demonstration, the principle introduced Linehan who spoke on the three keys on how to learn English. Next up, Koyamada lectured for 30 minutes on how he decided to study, live and work in the US and pursue his American dream of wanting to be an actor. During the Q&A, Linehan and Koyamada remained on stage and answered non-stop questions from the audience about studying English, living abroad, working in the US and pursuing one's dreams. The audience exhibited great interest in America and seemed satisfied, pleased, curious and completely opened up minded to the notions presented by Linehan and Koyamada.